Today our children are suffering the effects of weight gain and the associated diseases. It is estimated that more than 20% of our children are now overweight or obese. Where once children ran around all day and snacked on fruit, vegetables and wholegrains, we now see a population of spectators developing. Increased television watching, computer games and high fat food snacks like potato chips, chocolates and takeaway foods once seen as a treat, are now becoming the norm. 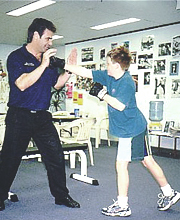 At Personal Training Gold Coast we understand this problem, so we have developed our kids program. The program is designed to educate them about health and create new interests in activities. Exposing children to activities that they may other wise never knew existed. Our job is to find activities that they enjoy and to help them become involved in healthier pursuits, whether it be, team or individual. We can help them to set goals, build self-esteem and develop leadership skills. It’s all about fun and teaching your children to get the most out of life.